Even Trappist Monks need a little cardio. Tsjeeses is comin’ to town! Dany shares a bottle of vintage Fantôme with us. Oma tops off her mug of Franconian lager with a watering can. A glass of lambic and Drie Fonteinen’s new brewhouse. Marc Limet from Brouwerij Kerkom enjoys a Bink Blond. Hel & Verdoemenis fermenting at Brouwerij De Molen. It looks like Søren Eriksen from 8 Wired in New Zealand likes what he just tasted. Mahr’s Bräu’s Stephan Michel explains the brewing process. Kulmbacher BierWoche — Bavaria’s second-largest beer festival, after Munich’s Oktoberfest — happens every Summer. The Shelton Brothers never miss it. A glimpse of the barrel room at the new Jolly Pumpkin Brewery in Dexter, Michigan. Time for a nice glass of Magic Rock. At Epic, it’s all about the hops! Looks like a nice place for a brewery! A view of Lake Neuchâtel in Switzerland from near Brasserie Trois Dames. Here are a few bottles of Anchorage’s barrel-aged beauties. The krausening at Pivovar Kout na Sumavé in the Czech Republic. At Brasserie St. Germain, even the stained glass drinks their beer. Le Trou du Diable’s Isaac Tremblay and André Trudel gazing at their barrel room. Urban Winkler and Daniel Shelton check out Klosterbrauerei Weissenohe’s open fermenters. Cases of beer from our old friends in Brussels. 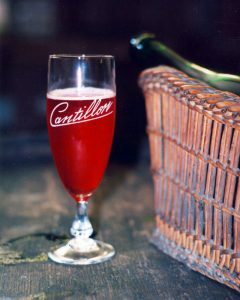 The brewing season has officially begun at Cantillon.